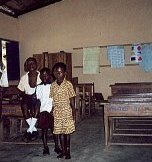 Mandeep Ranger visited Ghana on a four month placement to teach English as a foreign language to the children at the Junior and Secondary schools in Ekumfi Attakwah, a small village near Accra. World InfoZone helped out by providing a computer to assist him with his teaching and sponsoring his visit. You can read Mandeep's diary by clicking here. Mandeep's main class was Primary 4, a mixed ability group with an age range of eight to twelve years. He aimed to teach them all to master the basics of reading before he returned home. Primary 4's classroom was one of the better rooms: it had a flat floor, desks and some wall-charts. Initially his biggest problem with the other classes was the poor classroom conditions. There were no windows and dry earth floors: each gust of wind blew dust everywhere. Mandeep's other class was called JSS1. On the whole, motivation to learn was a problem apart from three very bright pupils which he tutored one-to-one. Schooling is relatively new to the village and parents are not used to the system. Teachers use the cane as a method of discipline. Most of the teachers are from the city and are posted to the villages - the lifestyle is quite a change for them as the culture and food is different. Mandeep was staying with a Professor who has built a library in the village. The computer we have sent seems to be working well and will eventually end up in the library. The Professor was head of civil engineering in Ghana and has a link with Newcastle University. The school day starts at 7.30am. Prayers are said at Assembly, the National Anthem is sung and children march to lessons singing a song. Mandeep usually started warm-up games at 8.00 to 8.30. Then he tried to work on reading. He gave them a five minute break about 8.55, followed by another 10 minute warm-up session, but it varied each day! The main break is between 10 and 10:15, but the kids usually arrived back in class at 10.35. Between 10.35 to 11.45 he tried to teach science. "Today was fab. We did floating and sinking, experimenting with plastercine pieces molded into different shapes ..... It was brilliant. They all loved it too!" School finished at 13.30. The village of Ekumfi Attakwaa came about from the original movement of the Fante people from the area today known as Techiman (in central Ghana). The Fante and their leaders Oburmankoma, Oson and Odapagyan left their home to find a new place to live to avoid the troubles in their village. Their first stop on this long journey was the town of Mankessim. Sadly the stress of such a long journey took its toll and Odapagyan died on of old age before reaching Mankessim. The other members of his village carried his body to Mankessim and he was buried at a place called Nananam Mpow. As time passed the journey continued and soon Osen succumbed to death. Oburmankoma, the only remaining leader decided to settle at Gyankomah, a village 3 miles west of what was to become Attakwah. After some years in the safety of the new found village and some generations later a descendent called Atta became the founder of Attakwaa. Atta was a skilled hunter, who decided to move away with his family as the population grew. Atta arrived at Attakwaa, which then was a rich forest. Attakwaa means Atta's forest: kwaa means forest. Atta always had a fire burning and people came to Attakwaa to get fire for cooking. Gradually people came to the area to join him. And this is how the village today known as Ekumfi Attakwaa came about, Attakwaa is the village name, however Ekumfi is the prefix used by outsiders due to its location in the region known as Ekumfi. Today in Attakwah there are three hundred permanent residents; there are also visitors from the city. Some families who live in the city (working as traders, electricians, taxi drivers and office workers) send their children to live in Ekumfi Attakwah with their grandparents as schooling is cheaper and parents find it hard to support their children in the city. The two local schools are T.I Ahmadiyya JSS & Primary school in Attakwaa and T.I Ahmadiyya SSS at the next village, Esarkyir. Attakwah's present chief is Oseku. There are around ten village elders who help him with decisions about the village. Buildings in Attakwah are constructed of available materials. Most of the village houses are made using mud with asbestos sheet roofing and some tiled roofs. Wood is used for shops and market stalls. The village people are mostly farmers who keep livestock such as goats, chickens and ducks and grow cassava, maize, plantain and yam to feed their families and to make food products for sale. There is no market in the village but the nearest one is at Mankessim on Wednesdays and Saturdays. One popular food product is gari (pronounced Gary), crushed cassava. The cassava is ground and remaining water is squeezed from it - it takes three days to remove the water before it is sieved and dry fried and left in the open to completely dry it. It is eaten with added water and sugar or boiled in water and served with fish or meat. The main food in the village is fufu. Fufu is made from boiled cassava, which is pounded until it forms a paste like dough, and shaped into a ball. This starchy ball is usually served with ground nut or palm nut soup. Fish including red fish are also added to the soups. Another form of carbohydrate is maize which is fermented and made into Banku. Chicken and goat meat and a rodent called a grass cutter are eaten but meat is rarely available. Fruit trees include coconut palms, paw paw trees and orange trees. The people drink water from the bore-hole, coconut water and orange juice with an occasional mineral water. Although there are Christians and Muslims in the village, traditional beliefs are still alive. Local beliefs see gods in charge of the village; there is some idol worshipping (Abosomsomfo) and ancestor worship. The festival of Akwambo is celebrated all over Ghana but in Ekumfi it is a time to remember the forefathers. 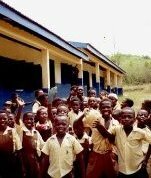 I have selected small samples from the huge teaching diary that I made from my time in Ghana. My aim is to illustrate what I found the teaching like, both difficulties and successes along with the emotions that came with those moments. Special thanks to all those children from the villages of Attakwaa, Ekrofo and Esarkyr for lighting up my life in Ghana and for some timeless memories. I hope you enjoy my selection of moments. A teacher from the primary school arrived at my host's house. Adam, (who was the Primary 1 teacher) introduced himself and explained that the headmaster had selected him, because of his good English, to be my link with the school. Adam accompanied me to the local school, T.I Ahmadiyya Primary and Junior school. On the short walk to the school all the villagers treated me like a celebrity. They all waved to me. Many people stopped to shake my hand and say "thank you" (as I was going to help at the school). Everyone was smiling and asking my name and where I was going. School was complete mayhem. The children were all out on break and ran to shake my hand. Many were shouting "Obruni" (literally white man, but used for anyone who is foreign) "How are you? ", "Where are you going?". Many ran to me, some even started a little fight over who could hold my hand. They were all extremely excited to see me. Everyone had huge smiles on their faces. After a warm welcome from the Headmaster I went into his office. The office was really quite basic: a desk and three chairs with an old cracked cupboard and a wooden medical cupboard with a red cross on it. I was also introduced to a few other members of staff. They were really interested in me, and all very grateful for my help. I was asked about England what it was like, what I did in England and why I came to Ghana. The head then discussed my subject areas. I was asked to teach Science, English and Maths to JSS1 and JSS2. I noticed a crowd gathering outside whilst I was talking to the Headmaster. Once our meeting finished I found out why. Of all things, the head led me out to eat coconuts! A child wielding a huge blunt machete cut the top off the coconut which I was handed and shown how to drink - but I already knew how which for some reason puzzled him. I think he expected that I had not eaten a coconut before! Then the child smashed open the coconut again striking it with the machete. I ate the coconut, which tasted absolutely great. Adam accompanied us to the secondary school. The school was located past the next village, Ekrofo, and at the start of the village of Esarkyir. Again the same celebrity status greeted me as I walked through the two villages: lots more children shouted and waved to me! The walk was approximately thirty minutes and was not the easiest in the mid-day sun, especially the last half kilometre which was uphill! The sweat was pouring off me. The Head and Deputy Head were there to meet me, and took me to their office. There I was given a refreshing malt drink (as Adam described it), which they called Malta. It tasted like liquid Bran flakes, but the pick-up was exactly what was needed! Again, my subject background was discussed. I was to going to teach English and Integrated Science to the most senior class, SS3. The Headmaster also said he would lend me a bike to save me the long walk getting to school from my placement. I was also given a science syllabus and textbook. This was great, as I knew I would have a range of experiences. A full syllabus to teach at SSS and my own plans at JSS. Overall it was a great day, it's true what they say, Ghanaians are very warm and welcoming. Everyone has been great, really excited, most touching was the gratefulness shown by the elders. I cannot wait for the teaching to begin!!! I arrived at JSS about thirty minutes before the start of my first lesson. After talking to the Headmaster an assembly was quickly called when Manu (who lived with me) rang the bell and all the children lined up outside the classrooms. The Head introduced me to the school, giving my name and where I was from, all in English. The whole school was looking at me while he was speaking. They were told they had to be on good behaviour in my lessons. My first lesson was a maths lesson with JSS1. It was hectic getting to the lesson after the assembly and most of the school abandoned going back to their lessons to watch me at work! I made it though the crowds to find a child cleaning the board. I watched the students come in. Manu walked in with the clock under his arm. The classroom was shockingly basic: a dust floor, only a blackboard and no posters or wall-charts. There were two to a desk, the seats and desk as one unit with 'Plan International' stenciled in blue on the front: some had three to a desk, many had rocks under the corners for balance. It really was tightly packed. It looked really crowded both due to the small size of the classroom and the children being too big for the desks. I tried to persuade the crowd outside to go, but most were still too excited to see me there. I wrote the date on the blackboard - it was filthy and my hands were covered in grey dirt after touching it. All the children's eyes followed me. I looked out again as the other children were there, and then they suddenly began to run as a teacher with a cane scared the children back to their appropriate lessons! JSS1 found it really funny. First, I made the students write out their names on a piece of card. Manu oddly wrote John Donkoh on his card, so I just called him John. I introduced myself and then told them where I was from. I used a postcard of a London bus to explain how I got from work to home. I had a photo of my house and a photo of my work place, and stuck them up on the board, several feet apart. I used the bus to show how I commuted to work. This broke the ice as there were a few giggles and most were smiling. The funny part was explaining that I sat upstairs on a double decker bus, which some found strange, an upstairs in a bus? Then I got the students to introduce their partners. I passed around a few pictures, which started a mad scramble. I intervened and explained how to pass them to the next person, it worked at first but then they went back to the snatching. I stopped this as quickly as I could and decided to attempt to teach mathematics. I put a few sequences on the board, then asked them to find the missing answers. It was easy for most of the class, but some got it wrong. The lesson ended with John (Manu) ringing the bell. He looked at the clock next to him, then continued to ring the bell outside the classroom. On the whole in went pretty well, my plan stretched the whole period of the lesson. They all seemed to understand and I found them an enthusiastic bunch. Manu, sat by the clock and he would monitor the time to go out and ring the bell. They all paid attention and tried hard. I asked John/Manu after lesson why he had two names, he just said, "my school name is John". Later I found out Ghanaians have two names, one for home and one for school. The home names tend to relate to days of the week, but Manus was named after his grandfather. Class JSS2 were completely different from the junior class which I had been teaching the previous lesson. I basically worked with the same introduction but used different mathematics. I encountered blank faces! At first I thought this was because I was going too fast, so I slowed down. Then I noticed a few smiles rather than confusion. A child left the room by the exit to the right of me without even asking me. I was quite shocked at first! Then I realized what was going on, some kids were leaving from the right-hand side door, running around the building and entering from the left door. I had a right go at the one that I caught, which shook the whole class! I think its better to start off strict and then ease off - that's what all my teachers were like! JSS2 were so different to the younger class. They had no real concentration span, with kids slumping at their desks, talking to each other and not looking at me. I asked them to make the name cards and some began to claim they had no pens. This completely caught me. I knew they were extremely poor but the others had pens before. Again a few members were smiling, which gave it away. I asked them to get their pens and told them I knew they were lying. The introducing their partners plan did not work as well as before. Their spoken English ability was nowhere near as good as JSS1. I quickly moved on to mathematics. Only four or five of the students seemed to understand the maths. It felt like it was a complete disaster compared to my first lesson. I was not sure if I was the problem or if it was them. I spoke to John, my host and Issac. They explained it was the class being difficult - maybe things will improve as they get to know me. I knew that teaching SS3 would be completely different to the other lesson. I had a syllabus to teach and parts of it were very similar to my A-levels. Some of the class was already sitting when I arrived. I asked where the others were. "They are technical students Sir" was the reply which meant they were on a different timetable. The room was basic again, but no way as bad as the JSS classes. The floor was concrete, although a little dusty by the windows and the blackboard was in a better state. One of the students got up to clean the board. I had a quick chat before the bell and the other students arrived. I was asked my age but dodged it, as some of the students were older than me! The class took its time to settle, as many were over five minutes late I had to keep stopping and starting my introduction. Then I discussed Chemistry explaining it's not an easy subject. I went through the basic ideas of atomic structure, mass numbers and atomic number. It was all fairly straight-forward to them. A few of the class looked extremely tired, one even stood up. I asked why and they said "It's too hot Sir". I told them that I found it hot and was still working. One girl walked out the class without asking, I asked what was going on but there was no answer and she left the classroom. I carried on. On the whole, the lesson went well. The class seemed to understand what I was teaching. I made it more basic than it was supposed to be to help get them going. Apart from the heat and leaving incident I was really pleased. I arranged to take Primary 4 as my main class covering four days of the school week with the fifth at the senior secondary school. I was in school for the start of the day, which started with the classrooms being swept clean by the children using brooms made out of thin twigs. Outside some were cutting the long grass with machetes. The other children moved the furniture and some dusted the board. Assembly was supposed to start at 8am but the bell was rung at 815am as they had continued cleaning. Assembly started with many children arriving late. There was only one teacher present and students were told to line up in colours. They sang the National Anthem. This was amazing, they stood in lines with right arm across chests singing 'God bless our homeland Ghana, and make our nation great and strong.' I could not pick out the rest of the words. The pupils were told to get into class lines. The teacher instructed them to march to a song which was in the local dialect. The children marched on the spot. The teacher pointed at groups to go to their class, singing and marching at the same time. Primary 4 were marching and singing proudly as I followed them to the class. They all sat down. The next part was hilarious. I said "Good morning class", they all stood up robotically and said "Goooood mooornig Sirrr". "How are you?" I said, then they all replied "We are fine, thank you Sir and you?". This made me giggle and I couldn't help replying "I am fine too!" Everyone in Ghana is fine, always. Everyone I ask in the village all say "I'm Fine". The Headmasters son, Ahmed, was in this class. He brought me the register: They answered individually "Present Sir". If someone was absent the whole class would say "Absent Sir". One girl'a name, Fatima, was called and the class said "Present-out sir". Fatima walked in, placing some water outside the classroom. Some children were walking in twenty to thirty minutes late. I tried the same introductions with the class as in previous lessons. They introduced their partner and told me what they liked. All of them liked the same thing - no one said any thing different to football or volleyball. Even after I tried my hardest to encourage it. I spent the beginning of the day going over phonetics and basic numbers. No one wanted to leave the class for break-time so I had to walk out the class to get them to follow. Break was great, they were all running around like headless chickens, playing football or just jumping around. After break I continued with phonetics and the alphabet. However they seemed to lose concentration and chatted in Fante (the local language), so I had no idea what was going on! I pulled out one of my learning games. I put them in two lines and wrote letters in different cases on the board (after checking if capitals were clear to them). I handed them chalk pieces, which caused a minor scrap. After they calmed down I called out a few easy letters (capital A, small b) and they got the gist of the game. I spotted a boy called Kofe eating the chalk while I explained the game. His mouth was white and he looked sick from the taste. The class were in fits of laughter, which I tired to stop as Kofe looked upset. Lunch time was a saviour, I was very tired and my voice was going. Again after a break they all looked lethargic and were not keen to carry on working. I ground out about half an hour on talking about 'ourselves' and then took them out for P.E. I tried "Duck, Duck, Goose" but changed the words to Elephant, Elephant, Mr Frog. I thought this was better as I did not expect them to know the other animals. After ten minutes of struggling to explain it, Yow (name for those born on a Thursday) turned up so I got him to help me with the explanation! They loved the game and continued to play for the whole period. I had to keep repeating myself, telling them not to smack each other on the head, instead of tapping. There were times when the game went totally wrong with people trying to overtake each other whilst running around the circle, and girls only picking their friends but soon all was in full flow. The main thing is that they enjoyed it. Ishmael left me in fits of laughter with his unique running style! Overall this has been my best day in this great country. The teaching has started well and I see it going places. The children were enthusiastic and the end of the day was classic. I was settling into my lesson when Adam appeared at my door. He asked me if I could finish my lesson as the school had to close for a strike. I brought the lesson to an end. The assembly bell rang and assembly called. The teacher told the students that school had to be closed from today, until Monday. Then the children went to lock up the rooms. This strike has caught me completely off guard. I have no idea what to do except hang on until Monday. I gathered from Adam that it has something to do with some teachers having no pay for up to eleven months, although they get some sort of living allowance. The strike continues - the same scenario as when it started - kids were sent home after assembly. I managed to keep Primary 4 in the class and squeezed in forty-five minutes of teaching before Adam came. I found out the strike was happening over most of Ghana and many people in Accra were on strike. I was getting frustrated about the situation, I needed to get a move on or time would fly by! In the evening I took John to visit the Headmaster to see what was going to happen. He very welcoming and we sat on the veranda with one of his children bringing chairs for us. I explained to him that my time was limited and that I needed to settle quickly to aid the class. I asked if the school could be opened, or just one classroom left open for me. He said that he could not do that as it would upset his staff. So I kept nagging and negotiating. A compromise was reached, but was not what I wanted. No teaching was to be done but I was able to get the classrooms open to play games. This way I said I could still spend time with the students. It's annoying but at least I have something for them to do from tomorrow. The strike continued, but very few children were around school in the morning. So I tried to round up as many as I could. I set off a game of bench ball using a measuring tape tied to trees, then used the favourite Elephant Elephant Mr Frog. I took my scheduled lesson time with JSS1 but played a game. I got them into pairs, one was blindfolded, one played the role of the eyes. They had to communicate to their partners first by saying left, right, back forward (ha ha sneaked some teaching in!). Then added a different number of claps for the various directions. I set up an obstacle course using furniture and timed each pair. I added a competition element by timing the pairs to see which complete the course fastest.